#MetaHash (MHC) Trading Competition: Win 5 BTC! Users will be ranked in terms of the total MHC volume traded greater than or equal to 1000 MHC on KuCoin (including both buys and sells) across all MHC trading pairs during the competition period. 1. TOP 5 Traders: 2 BTC in total to win! The top 5 accounts with the highest trading amounts of MHC (buys +sells) on KuCoin will win a share of 2 BTC rewards in proportion to their trading amount. If you enter the top 5 according to your MHC trading amount during the competition, with a transaction volume of 10,000 MHC and the total transaction volume of the top 5 users is 100,000 MHC, your reward proportion will be 10%, which would be 0.2 BTC. 2. TOP 6-100 Traders: 3 BTC in total to win! 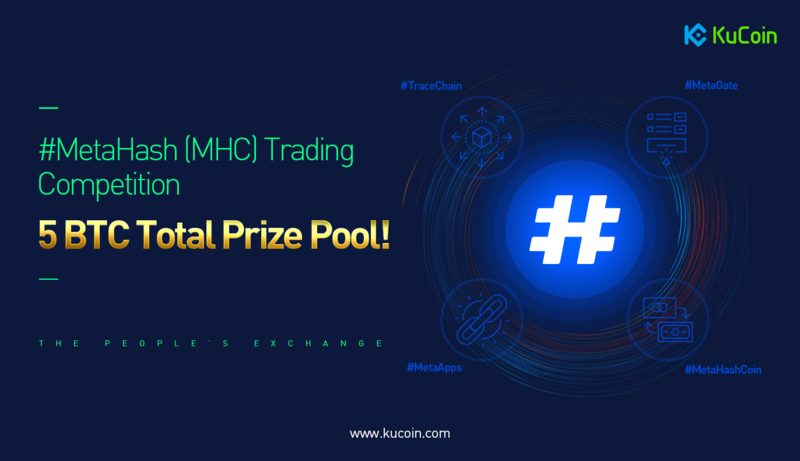 Participate in trading MHC on KuCoin during the competition. Top 6-100 accounts with the trading amount of MHC (buys +sells) on KuCoin will share 3 BTC as rewards! Want to get more trading fee discounts? In order to show our appreciation for the continued support received from our users, KuCoin is now launching a new Tiered Trading Fee Discount Program. *Note*: KuCoin will update the latest trading competition rankings before 20:00 every day from Mar 21, 2019 (UTC+8).